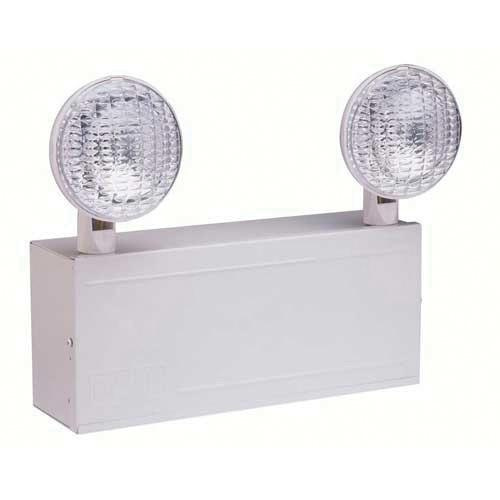 Hubbell Lighting Dual-Lite LiteForms® 2-Head high capacity emergency light unit comes with two 7.2-Watt PAR36 incandescent lamps. It features white thermoplastic housing. It has voltage rating of 6-Volts. It has power rating of 66-Watts at 1-1/2 hours, 51-Watts at 2 hours, 35-Watts at 3 hours and 27-Watts at 4 hours. This emergency light unit features lead calcium battery. It measures 4-3/4-Inch x 13-1/2-Inch x 27-1/4-Inch. It is wall/surface mountable. Emergency light unit is ideal for industrial and commercial applications. It withstands temperature rating of 20 to 30 deg C. Emergency light unit is UL listed and meets NFPA standards.